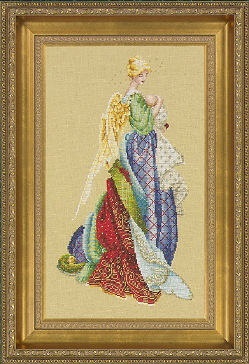 This long awaited design is an angel with an infant in her arms, the image of nurturing comfort and deepest inner peace. Her gown, with hidden roses, is a collection of vivid brocades providing the stitcher with smaller areas of intricate challenge. Directions are included to stitch her without wings. A replacement part of the back of her gown is included. It has the optional one over one skin areas which gives the realistic quality to the finished piece. 7 3/4" x 13 3/4"
Copyright © 1998 Marilyn Leavitt-Imblum. All rights reserved.